Business is the perfect mishmash of strength and sport. And when your business is inseparable from your name, and that name is attached to a sport, naturally, you must be physical. That's one reason that Billy Sims may be seen at one of his Billy Sims BBQ restaurants wiping counters or busing tables. 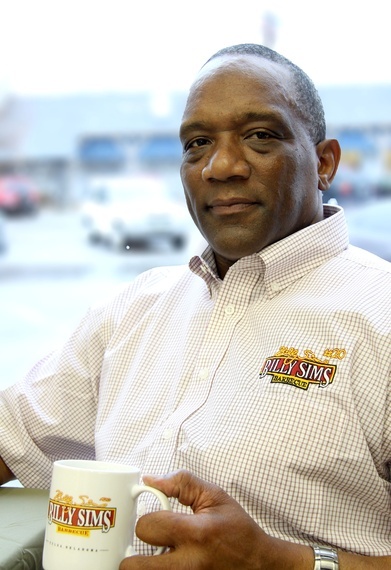 "Business is a lot like a football game," says Billy Sims, 58, co-founder of Billy Sims BBQ. "In a football game, and a business, it's about the fans and the customers. They are what keep the doors open. People know me from football, but I want them to try my barbecue, and say that it's pretty good, and to have a good experience." Billy Sims was a superstar who practiced as rigorous as any running back in the league. Following retirement in 1984, Sims attempted a variety of ventures, all while remaining in demand on the memorabilia circuit. In the fall of 1999, Jeff Jackson owned a sports card store in Tulsa, Oklahoma, and he invited the popular athlete to participate in an event. He immediately liked the charismatic Sims. Not only did enjoy his presence, but he felt that Sims could succeed in business if he were provided the right conditions. "Billy began signing autographs and talking with people early in the morning," says Jackson, 45. "He was still there at the very end of day. The remarkable thing that I noticed was that he treated everyone like he knew them. As far as a genuine personality, he will talk to anyone, and Billy is one of the most personable guys I've ever met." It was Jackson who nudged Sims into the restaurant business, and, 2004, the partners launched their first unit in Tulsa, a 1,000-square-feet operation in the Farm Shopping Center. "At the time we started the first restaurant, I was living in Dallas and working with a charter school company. But Jeff had the memorabilia store in Tulsa, and he was really thinking outside of the box. It was especially important to me, because it would have my name on it, and when you put your name on a restaurant, you don't want people looking at you, and saying, 'he can run, but he can't cook.'" 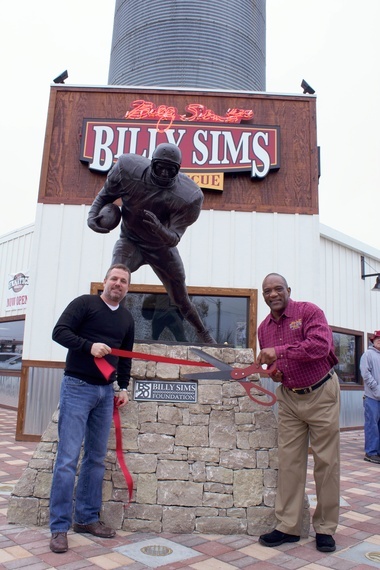 Despite setbacks and the naturally humbling checks and balances of business, Billy Sims BBQ has blossomed into one of the most successful celebrity-based and sports-based franchises in the United States. 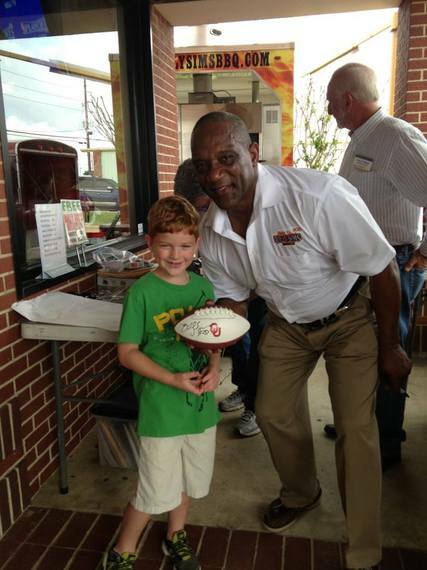 Billy Sims BBQ began franchising in 2008. With 40 locations, as well as 8 more in development for 2014 (four of which should open in March), Billy Sims BBQ has locations in Missouri, Michigan and Texas. Two flavors of Billy Sims BBQ sauce are available in approximately 300 stores. Entrepreneur magazine ranked Billy Sims BBQ number 349 on its list of top 500 franchises, and one of its top 25 upcoming franchisees. "You never want to sit back on your laurels," says Sims. "You always to get better and be better, get better people, better customer service. We like making people a part of this great organization, and try to make it one big happy family." "We are good partners," says Jackson. "We have a good, stable company. Billy shakes all of the hands, and he kisses the babies." Whenever a business decides that success has been attained, the progress stops. Both Sims and Jackson see the continuance of their brand in franchising. They have even developed a 30 day Billy Sims University, which consults franchisees on growth. Billy Sims is less a visionary than a diligent worker. "Billy really likes to take care of everybody," says Jackson. "Honestly, he has a car that has about a half a million miles on it, and he probably knows every toll booth operator in Oklahoma." "I can't tell you how many people bring in their kids to meet Billy," continues Jackson. "Right now, we see a lot of people in their mid-30s to 40s, who are bringing in their 10- and 15-year-old kids. I've watched people cry in front of him -- people who remember watching him and who grew up with him Oklahoma. Billy is a genuine guy, a guy who loves to be out there. He can talk until the end of the day." "That's the good thing about this business," says Sims. "You never know whose life you may touch." Trent Crow, 50, is the franchisee of four Billy Sims BBQ restaurants in the Oklahoma City area. He says that he retired from Walmart after 28 years of service in 2010, and that his former job required him to interact with a fair share of athletes. "I dealt with a lot of sports stars, from Dallas Cowboys to Dallas Mavericks, when I was working at Walmart," says Crow. "I can say that Billy is the most humble, down-to-earth guy you can ever meet. At one grand opening, he got there at 7:30 in the morning and he stayed for three days, from morning through night." No matter how gregarious Billy is, how wide and disarming his smile, and how deep the affection between he and his customers, ultimately, it has to be about the goodness of the grub. It's about the look, touch, and fresh taste of the barebones barbecue. Jeff Jackson concedes that "if the food is bad, people are not coming back." "If there is a complaint," says Jackson, "it will come to my desktop and I check every email. People generally contact us because they want Billy to succeed." Henry Ford once said, "A business absolutely devoted to service will have only one worry about profits. They will be embarrassingly large." Billy Sims BBQ is devoted to serving its franchisees in an honest, circumspect manner. "We instruct them on all of the nuances of learning food," says Jackson. "And being in the restaurant business, they need to know and have the idea that what they are doing is more than tough - it's one step above tough. Things like keeping paper usage at 3 percent, instead of 4 percent. Or that you will lose a yield of 50 percent of a brisket. We are there to help them price their products right to make money and always stay competitive." Life of Billy Sims: "More of a Baseball Fan"
Born in St. Louis on September 18, 1955, Sims was a street smart kid who at an early age identified with his baseball heroes. "I was always more of a baseball fan, and a St. Louis Cardinals fan. I always thought that I would have been the next great pitcher, the next Bob Gibson. He was my hero. I met him about 8 years ago in St. Louis, and you'd a thought that I was three-years-old. Baseball in St. Louis was my sport, and I still have great memories of the Cardinals and Lou Brock. We inner city kids all played baseball -- and we went to the ballpark. I was a paperboy, too, back then, and I always went to the ballpark." Sims ended up in the country after his mother sent him to live with his grandparents in Hooks, Texas, when he was in the eighth grade. Sims loved the quietude of the country. He had to work to help his grandparents. Tucked in the northeast corner of Texas, he worked odd jobs and never minded sullying his boots. He planned to open up a couple of mechanic shops. "I was working 7 days in the summer, from 6 in the morning until 6 at night. With the money saved, I used for school clothes. I just liked to work. After the football games on Friday night, I would spend Saturday at work cleaning the stadium and sometimes Sunday on other projects, too. I shoveled manure, chopped hay and hauled cotton." He pumped gas and fixed flats at Pat James' Conoco station in Hooks. "Having a clean bathroom, well, that is definitely one of my pet peeves. In high school, I was working at a gas station in Hooks, Texas, and I remember how that bathroom had to be cleaned. That tells you a lot about a place." Former Marine drill instructor 'Big' Jack Coleman -- at 5-10, 180 pounds, and sporting a crewcut -- was Sims' high school football coach at Hooks. "'He was a tough guy and a good guy. I didn't ask why they called him Big Jack. He treated everyone the same." By his senior year, Sims was a remarkable high school athlete who got noticed by recruiters in the football-crazed state of Texas. That Conoco station was where Oklahoma Sooners head coach Barry Switzer first called Sims, then a high-school senior, in October 1974. 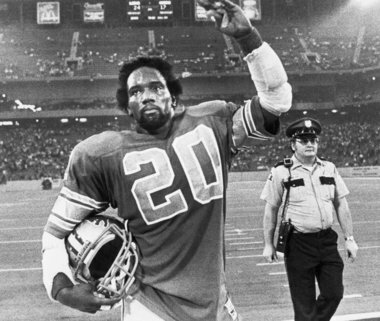 Billy Sims, the 1978 Heisman Trophy winner, enjoyed an incredible rookie campaign with the Detroit Lions in 1980. He was one of only 4 NFC runners to top the 1,000-yard mark, and was voted as NFC's Rookie of the Year. Sims ran for 4,419 yards and 37 touchdowns and had 1,833 receiving yards over his first four professional seasons. A knee injury prematurely ended his career. He exited the game with a lump-sum payment of $1.75 million from Lloyd's of London, thanks to an insurance policy against career-ending injury. Sims: "Find Something You Enjoy"
Life without football is a sore transition for many players, including Billy Sims. Sims left pro football wealthy, but naive -- trusting people who had ideas of how he should spend his wealth. Following a series of failed businesses and risky investments, Sims filed for bankruptcy in 1990. He invested in everything from radio stations to a water purifying business, and his bad business deals include a dinette manufacturer, a nightclub, a pipe-fitting company, a car parts manufacturer, and a small chain of catfish restaurants. "Billy was surrounded by bad business men, and a lot of people who took his money," says Jackson. "At the end of the day," says Sims. "I needed something else to rely on besides football. I had to stop playing and I never looked back or regretted it. There are hard points in life that you learn from, and it's not how you go down, but how you get back up." There was a time when Billy Sims' life was a crumbling pile of crushing business debts. But today, Billy Sims BBQ is rising and the company seems to have successfully navigated through all of the nation's lean economic times. "No matter what happens with the economy -- good or bad -- people are still going to go out to eat," says Sims. "They are still going to want to go out and eat fresh food." More business is lost every year through neglect than through any other cause. But you won't find Billy Sims slacking on the job. He never shied away from the hard work, in high school, at Oklahoma or Detroit. He didn't rise to his stature by being indolent. He is the model hands-on owner. "It's 40 hours, 7 days a week, and you can't have any down time when it comes to this," says Sims. "It's good for me to be in barbecue, and to have found something that is enjoying. So, I'm never concerned about time." Sims says that he finds happiness, fulfillment, and a better sense of self in the restaurant business. And if the people come, he will provide his presence. "I would start wondering if it was about over when they stopped asking for autographs," says Sims. Last year, a Billy Sims BBQ opened in the Detroit Lions stadium. "They have a loyal, loyal team," says Sims. "They like to reminiscence. And they still support me." Perhaps it is only natural that one day there will be more people who associate Sims with his restaurant than with his previous experience in football. "If they like the barbecue, then I'm okay with that," says Sims. Brian D'Ambrosio is the author of 10 books, including a biography of legendary screen actor Charles Bronson, "Menacing Face Worth Millions," and a recently released book about the lives of former NHL tough guys, "Warriors on the Ice: Hockey's Toughest Talk."